Light Pollution Hides Milky Way From 80 Percent Of North Americans, Atlas Shows : The Two-Way More than 99 percent of the people living in the U.S. and Europe look up and see light-polluted skies, according to a new atlas of artificial night sky brightness. 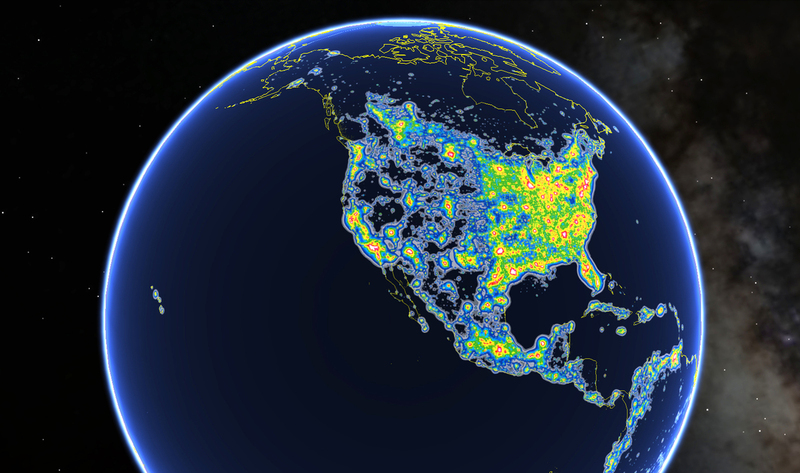 This view of North America as seen in Google Earth shows colored areas that denote levels of light pollution as detailed in the New World Atlas of Artificial Sky Brightness. The luminous glow of light pollution prevents nearly 80 percent of people in North America from seeing the Milky Way in the night sky. That's according to a new atlas of artificial night sky brightness that found our home galaxy is now hidden from more than one-third of humanity. While there are countries where the majority of people still live under pristine, ink-black sky conditions — places such as Chad, Central African Republic and Madagascar — more than 99 percent of the people living in the U.S. and Europe look up and see light-polluted skies. The country with the worst light-pollution is Singapore, where researchers found that "the entire population lives under skies so bright that the eye cannot fully dark-adapt to night vision." Other countries with large percentages of people living under skies this bright include Qatar, Kuwait and the United Arab Emirates. "We've lost some of our view into the cosmos," says Chris Elvidge, a physical scientist at the National Oceanic and Atmospheric Administration who was part of the team that created the new atlas, published by the journal Science Advances. "There are still people that can remember when they used to be able to see the Milky Way when they would walk outside at night, but those are becoming fewer and fewer." 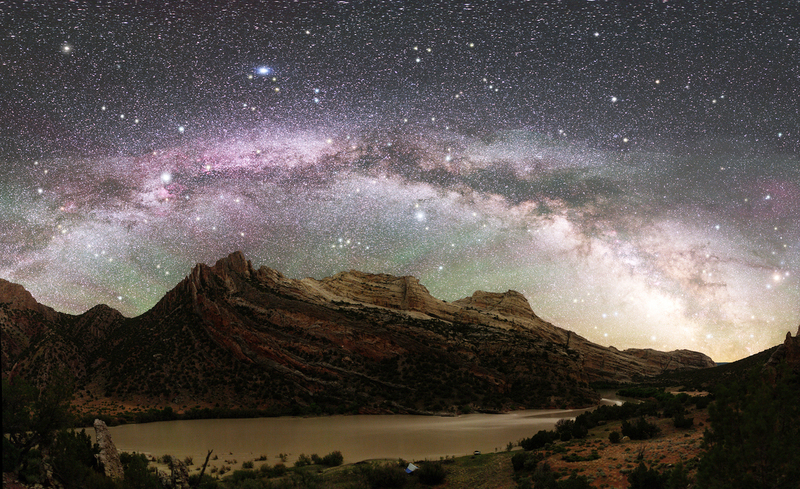 The Milky Way as seen from part of Dinosaur National Monument, which is located on the Colorado-Utah border. Light pollution over Joshua Tree National Park in Southern California. He personally lives north of Denver, where he can see just a few stars. "You'd have to drive two or three hours, from here, to get out into a place where you can see astronomical features," Elvidge says. He worked on the first world atlas of light pollution, which came out about 15 years ago. "It was an ambitious project then. It's an ambitious project now," says Dan Duriscoe, with the National Park Service's Natural Sounds and Night Skies Division, another member of the research team. The original atlas found that about one-fifth of the world's population had lost the ability to see the Milky Way with the naked eye. But scientists say the latest atlas is not directly comparable to the first one because it used different information, such as data from a new satellite. Researchers had to combine that data with observations from the ground and computer models of how light gets scattered in the atmosphere. "It's really one of the most thorough studies that we have to date on light pollution across the globe," says Cheryl Ann Bishop, communications director for the International Dark-Sky Association, which fights light pollution. "The fact that we're bathing our planet in artificial light at night is a relatively new phenomenon, and it's essentially akin to a human experiment that we're only just beginning to understand the ramifications of." She says light pollution is still kind of on the fringes of what most people consider to be pollution, and one of the biggest challenges her organization faces is increasing awareness of this problem in developing countries. "They just want more light — bigger, brighter light," she says, "because that's what they understand is development." The selection of a light fixture and the bulb, however, can make a huge difference in how much light escapes into the sky. Certain kinds of LED lights, while being more energy efficient, actually will dramatically increase light pollution, Bishop says, "and that's really a concern for us." In the U.S., some communities have been taking action on light pollution, says Elvidge, who praises the new streetlights in his home state of Colorado. "They are really well-designed," he says. "I think that is a result of public campaigns to reduce sky brightness and light pollution. It's been taken up by cities and towns. They write it into the codes and then the builders have to meet those codes." Nighttime natural scenery needs protection just like daytime scenery, Duriscoe says. "In the daytime, you might go to the Grand Canyon and be disappointed if there was a veiling haze in front of your view," he notes. "The same is true at night if this haze of light that is scattered through the atmosphere is obscuring your view of the heavens." His research shows that some national parks still have near-pristine skies. "Dry Tortugas, off the coast of the Florida Keys, is pretty much unaffected," Duriscoe says. "Big Bend National Park is right up there as the one of the darkest." And, of course, Death Valley is known for its dark skies. Duriscoe says he grew up near Los Angeles, where it never really got dark, and that's why he vividly recalls one time in the late 1960s, when his family was driving out of Death Valley at night. "We just sort of stopped the car and got out," he says, "and were just amazed at the total absence of artificial light."